Slow Cooker Philly Cheese Steak Recipe | Large Family Style! 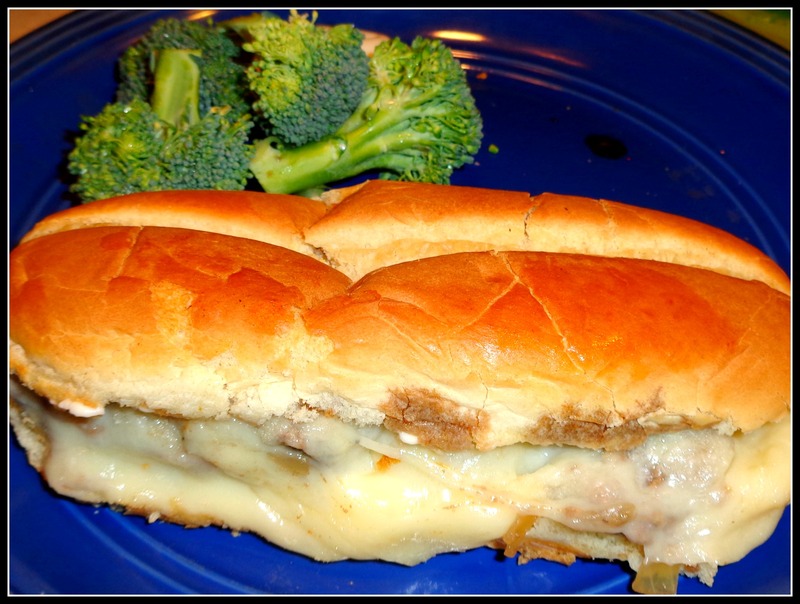 When I make this Philly cheese steak recipe, I use whatever type of beef roast I can get. I used bottom round roast in this recipe because it’s what Aldi had on the day I was shopping. My pregnant self was not going anywhere near Wal-mart that day, so I am making use of what I could get. I had right around 4 1/2 lbs of beef to use in this recipe, so adjust your ingredients based on the amount of beef you have. One thing I do right before serving this recipe is to put the hoagie buns into the oven with the meat and cheese on them, so they get all melty and toasted and yummy. Now, this meal might seem like a pricier meal than I usually make; but if you consider that I am feeding nine people, along with me being very pregnant, then an entire meal of Philly cheese steaks for around $17 doesn’t seem quite so expensive. Chop green peppers and onion and place in slow cooker. Add spices, soup mix, and beef broth to slow cooker. Cut meat into chunks and add to slow cooker. Stir everything around and get it all mixed up well. Remove meat and slice thinner if needed. On each hoagie roll, place some of the meat and top with 2 slices of Provolone cheese. Place stuffed rolls on a baking pan and toast at 400* for about 3-4 minutes. Serve with sides of your choice! 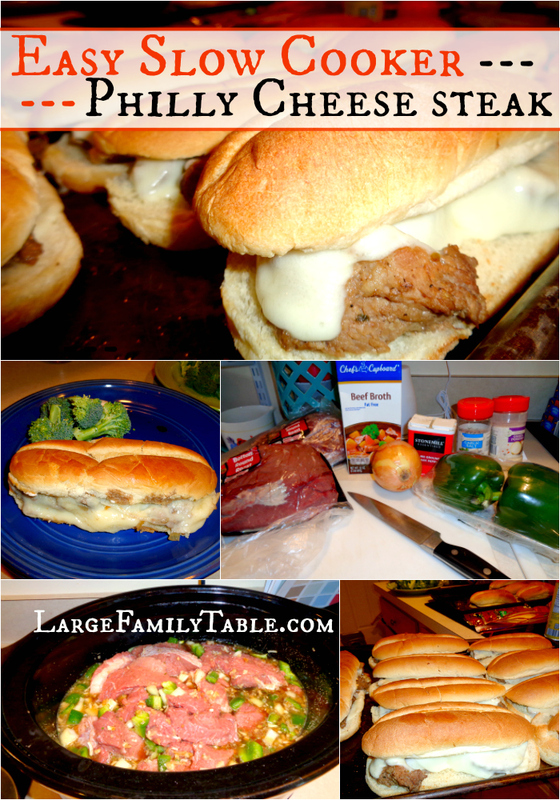 I served my cheese steak sandwiches with fresh broccoli and dip, but this is delicious with any sides you like. And don’t let what you think Philly cheese steak should look like hold you back from trying this wonderful recipe – I don’t have a meat slicer to get the fine strips of meat like you see at restaurants. But I don’t let that stop me; I just go at it with my kitchen knife and call it good enough! One more tip – if you have kids that won’t eat the cheese steak sandwiches, you can make them a simple grilled cheese sandwich while you are melting the cheese on your Phillies. Just place the cheese on the hoagie buns and put them in the oven right alongside your cheese steaks, and there you go! Easy-peasy grilled cheese sandwiches. Click here to watch the full Homemade Philly Cheese Steak in the Slow Cooker Recipe vlog. And if you made it all the way to the bottom of this blog post I have something special for you! I haven’t shared or promoted this yet, but I’ve been working the last several days on setting up the Large Family Table Shop here on the blog (Thank you, Travis, for having the past week off on Spring Break! Hello, help with the kiddos ;). I’m still adding goodies to the shop and hope to have it complete by the end of this week. You should still be able to head over and check it out here. I have several helpful freebies like my Family Meal Planner Collection, The Beautiful Household Management Binder, the Caffeinated Daily Planner, and more over there for free at the moment. Also, the few paid products I have loaded are heavily marked down. Check it out! 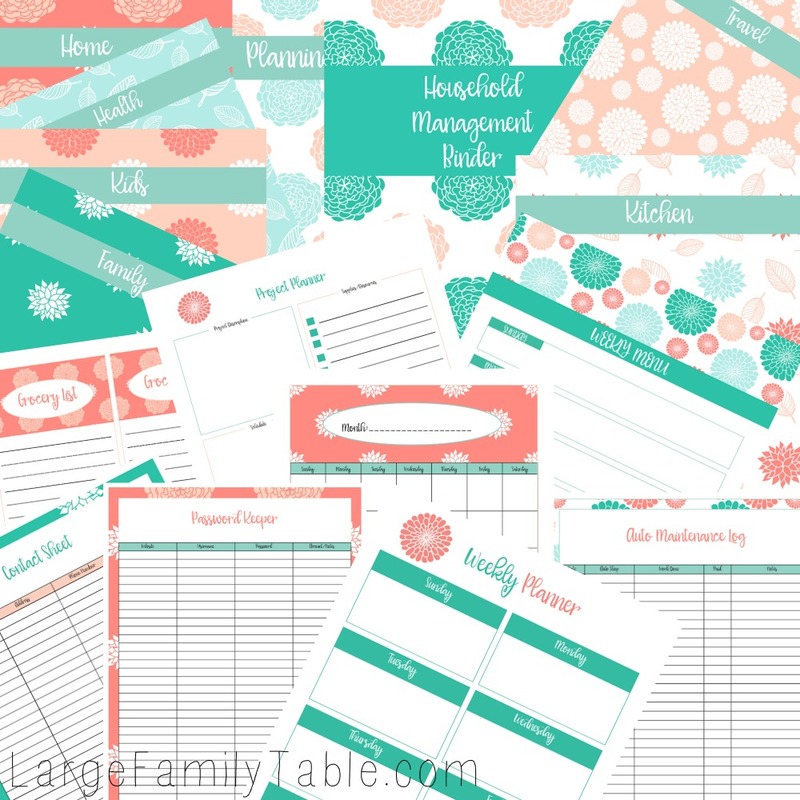 Get your currently free copy of The Beautiful Household Management Binder here! I hope you love this recipe. Be sure to comment below and tell me if you try them! This looks delicious! Going to make this sometime this week. Thank you for the recipe! Oh my gosh this looks so good. I know this is something the hubby and kiddos would eat for sure! Thanks. Thanks for the recipe. This is one I will definitely try. Anyway to stretch beef is always good. All that wonderful broth that was left would make a wonderful soup base too. Just throw in some vegetables and a handful of rice with any left over meat. I just made a similar recipe this last week. I found it on Pinterest; it’s not exactly this, but super close. It was delicious. I actually used venison and it turned out so tender. I just found your YouTube Channel this week and was watching a grocery haul. A couple of my kids stopped by to watch, and said, “Why in the world are you watching another woman live your life.” I thought that was pretty funny. I’m really enjoying the recipe vlogs. Hi my name is Tonya I was watching some of your YouTube videos and noticed you said you might get another crockpot . I love my casserole crockpot . It’s great for lasagna . I have a family of only five but my kids are grown 15, 25, and 26 so they eat a lot and it feeds us well. Love your large family meals.